Our Mission: Providing a home for the Irish at heart , building and researching community through culture, identity and friendship. 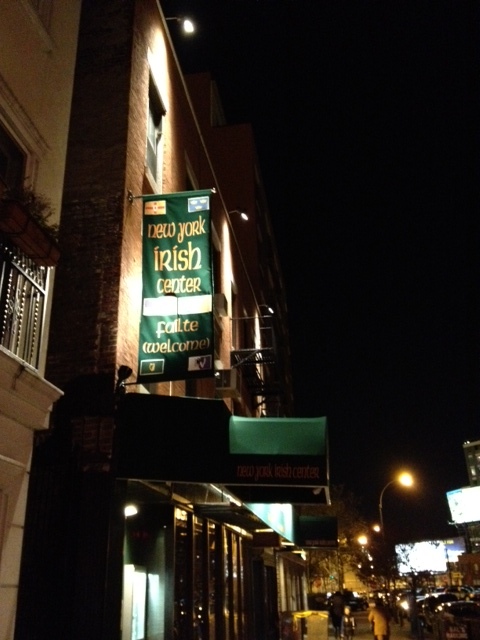 The New York Irish Center is a community center in Long Island City, where a warm welcome awaits the Irish in the region and, in true Irish spirit, all those who wish to be with us. Long Island City is not, you may be surprised to know, on Long Island per se, but is instead in Queens, in one of the most up-and-coming neighborhoods of the city. It sits right on the East River with a spectacular view of the Manhattan skyline. We are just one stop from Grand Central, a mere five minutes, on the #7 subway line. Everything begins with an idea and thus our building is a big part of our story. When Belfast native Fr. Colm Campbell first envisioned a place for the Irish to gather, he didn't dare to imagine his idea could aspire to a place to call its very own. It was not until well-known Cavan man, Paddy Reilly, pointed out to him that this was the only way to go, that having a building would give the Center the permanence it needed to last the course, and be true to its mission. Enter some additional community leaders, and a property was secured in 2003. Following an enormous injection of sweat equity for renovations by its early members, and tremendous generosity from Irish building contractors, the Center opened its doors to all in 2005. And we're here to stay, as our ongoing massive capital project to build an elevator, servicing all four floors, can attest. Our location is significant too. Yes we are just a quick hop from Manhattan but we are also readily accessible from all points along the #7 line which cuts through many traditional Irish neighborhoods; Sunnyside and Woodside especially. And not far beyond that is Maspeth and Middle Village for example, where many Irish, now with young families, have settled. But above all else, we are about community, and the mission of the Center is to provide a place for our community to be together. At our core we are the generation that left Ireland in the 1980s, a time of deep recession but also a hopeful time. With easier travel and emerging Internet technology, those that left Ireland could now stay in touch as never before. They brought new life to the ties that bind two great nations, playing a huge role in the peace process and Ireland's advances on the world stage. Twenty years plus later, the Irish of 1980s increasingly form the backbone of our community in New York, an anchor between young and old. That's what's happening at the Center these days, with events and programs and classes for all ages, where the generations often mix, and where a steady stream of volunteers with a desire to give their time to the community can find a home. Our renovation and elevator installation was completed in April 2014, giving us even better infrastructure, allowing even greater possibilties to provide a home for our community. We can credit ourselves at having successfully accomplished an important first step in the pursuit of our mission i.e. building a community. Now, with these two pillars of support (a community and a community center) in place, we can get to the key component of our mission - caring. Partnering with The Gallagher Initiative: The first study of Irish and Irish American Seniors in the US was launched at the New York Irish Center. Extensive Audio Recordings of our Senior Members, in the style of NPR's Story Corp series. We've added a social care component to our professional staff. Suicide and depression, as it is in Ireland itself, is a growing problem in the modern era. Our research shows the problem has made its way to Irish immigrants in New York. To address this problem in a meaningful way, we have developed a partnership with Solace House, a provider of suicide prevention and intervention services, with deep experience working in Ireland, who operate a service from our building. Solace House is fully aligned with our mission and compliment our services. Perhaps you had thought being part of a community wasn't important, that the every man for himself world in vogue a few years ago would last forever? The founders of our Center had every opportunity to think that, but didn't. Instead, they understood that their Irish heritage was key to their success, that a community hundreds of years in the making made their lives that bit easier and fortunate. Thus, when Fr. Campbell came forth with his plan to establish our Center, they couldn't but get involved. We invite you to get involved too. Elsewhere on this website you'll find out more. To paraphrase a Native American saying, we have not inherited our heritage from our ancestors, we've borrowed it from our children.